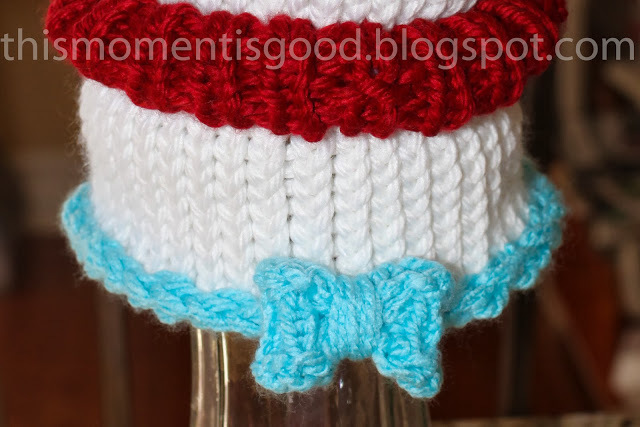 Loom Knit Dr. Seuss Hat (Free Pattern) | Loom Knitting by This Moment is Good! 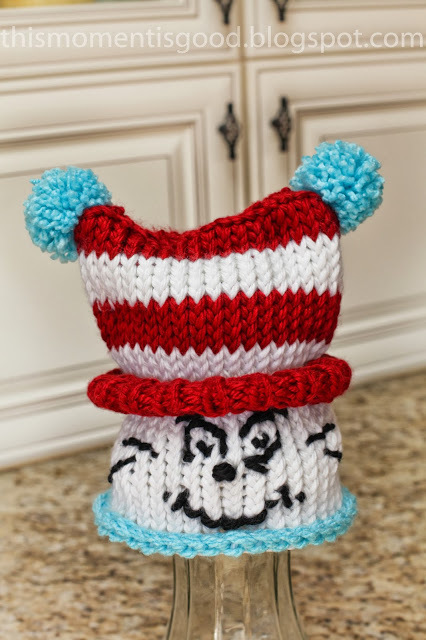 Fun, Cat in The Hat, Loom Knit Hat Pattern! After making my loom knit bows the other day, I started thinking about a project where I could incorporate them. I remembered that the Cat in The Hat always wears a bow tie. 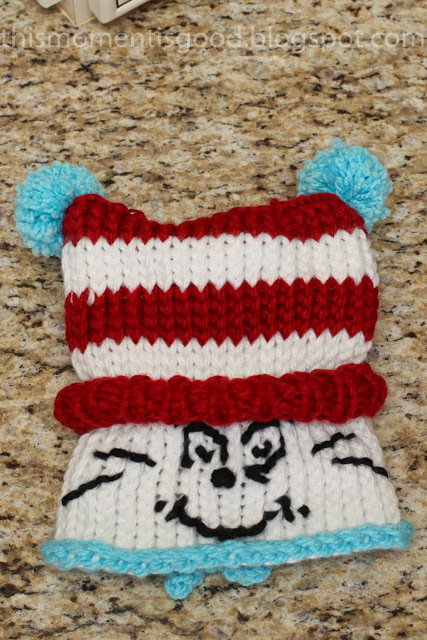 I think Dr. Seuss is a special memory for most kids so I thought it would be fun to loom knit a hat with that theme. Originally I planned on putting the bow under his chin in the front but then realized that although it would look cute in a picture, it probably wouldn't be fun to wear. I decided to add it to the back of the hat. I think it fits there perfectly. I have to admit that my Cat in The Hat's face looks a little naughty so if you want a happier version just widen his mouth and bring up the sides of his mouth higher. This hat is pretty stretchy so I think it would fit kids to adult. I would just shorten it for a child unless it's going to be used as a costume. We spend every Halloween with my young nephews so I'm thinking about wearing it next year as the start of my Halloween costume! -Fold up brim by placing 1st red row of stitches on loom (1 stitch/per peg, this will cause your knitting to bubble outward as seen in the photo). 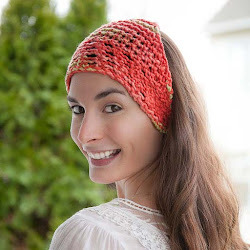 -flatten hat and sew a straight line along the top of the hat. -Split (1) strand of black yarn in half and sew on whiskers. 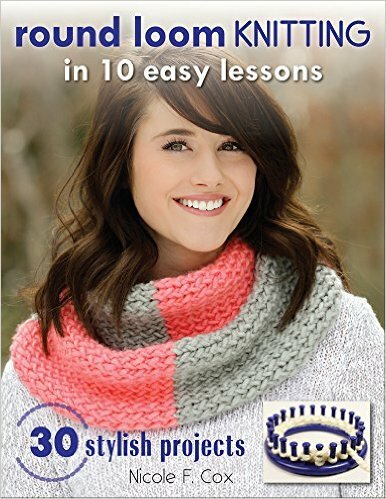 -Make (2) pom poms with medium pom pom maker. attach pom poms to hat. I have a 3 year old nephew with ALL (Acute Lymphoblastic Leukemia) and I am knitting him an assortment of chemo hats. This one would be fabulous. 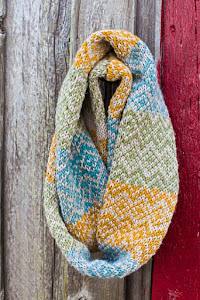 Is the pattern anywhere to be found/purchased? Checked your blog sight but did not see it. The problem should be resolved now +Brightone. Please let me know if you have any further problems viewing the pattern. You may have to refresh your browser to see the fix.